Posted on October 18, 2017 at 5:47 am. The second concern when purchasing a heating and cooling system is the warranty. After getting the information about the unit itself, customers then ask what the product and service warranty includes. This somehow affects their decision whether to get the contract or find another company to place their investment. Let’s just say that you find the right unit for your home and even get the best warranty offer. That’s a good catch! However, having a warranty doesn’t mean it’s fine if your system fails due to your carelessness or other reasons. No! Your negligence may cause your warranty to be void. 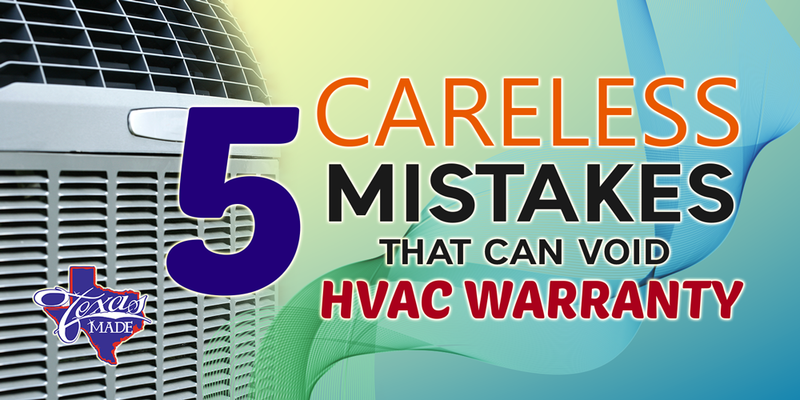 Here’s a rundown of the mistakes that can void your HVAC warranty. The best part after purchasing a product is using it. Due to extreme excitement for the new investment, many homeowners forgot to fill out the warranty form. What they don’t know is that failing to register may void the warranty, or if not, may cause delay maintenance and repair services. HVAC manufacturers suggest the use of Original Equipment Manufacturer (OEM) parts for their units. While using off-brand products are also safe to use, they’re not tested for compatibility with the system and may cause problems to the unit. Using third-party products can void your warranty and may leave you hanging when something goes bad in your system. Warranty may become void if the system is not properly installed. Most HVAC issues happen because of incorrect installation and the manufacturers are not liable for that. That’s why it’s always necessary to let a professional HVAC technician install your systems. Regular maintenance is an important requirement for any HVAC unit. It should be done at least twice a year by a licensed HVAC technician to maintain the efficiency of the system. Air conditioner manufactures now mandates that you have your air conditioner maintained to keep your AC warranty valid. Be sure to keep all documents regarding your purchase of the product as well as regular maintenance services. There are instances when warranty becomes void due to failure to providing proofs of regular service tune-up. If you have concerns about warranties and home comforts, contact the professionals at Texas Made Heating and Air Conditioning. Residential and commercial HVAC works are our expertise.